hi, all! happy Friday! well, i have some news...if it doesn't happen sooner, we are having a baby on Monday, March 4th! after testing, it looks like Little #2 is still doing great but my doctor would prefer to get him or her out sooner rather than later. my due date is Thursday the 7th so it's not extremely early or anything. i have to say, once we started thinking about being induced early, we got used to the idea and were hoping my doctor wouldn't change his mind. Mr. Bagubian was born on a Sunday afternoon at 1pm. leading up to that, i had contractions on Wednesday night, Thursday night, and Friday night--all night long--but real labor didn't start until sometime on Saturday. so i didn't sleep much for about 4 days before he was born and it was exhausting and discouraging...i don't really want to go through that again. on top of that, my doctor wasn't on call that weekend so another doctor--whom i didn't like AT ALL (he was rude and condescending and LATE to the delivery)--actually delivered Gooby. i'll happily avoid all of that this time around if i can. March 4th also happens to be my mom's birthday so it would be really nice to have the baby that day. 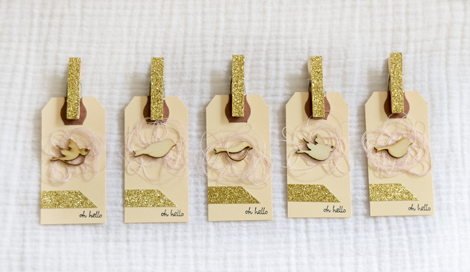 so that's what's going on with Little #2...what's going on here are some little pink and gold birdie tags i made. i told you i've been obsessed with gold for a few months now and there's something about pairing it with light pink that is so dreamy! 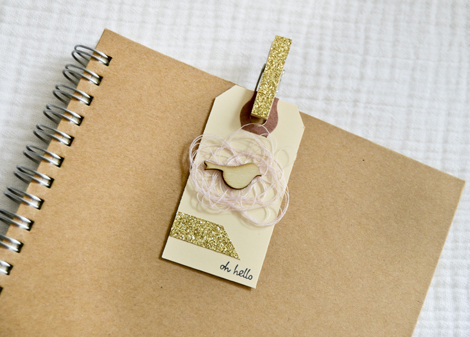 i used a small manila shipping tag as the base and i think the cream also enhances the color combination. 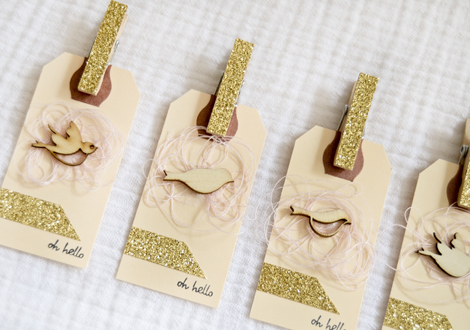 the only pink comes from the pile of messy thread behind the bird, but it's enough to compliment the gold. 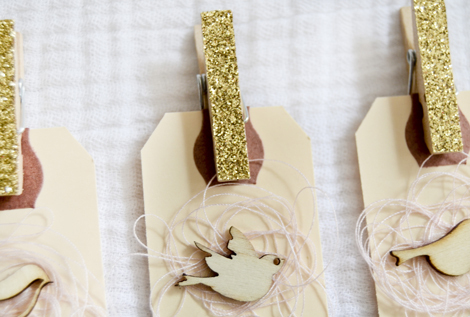 the wood veneer birds are from Studio Calico and i LOVE them! they are just so darn cute and delicate. i'm getting kinda obsessed with wood shapes anyhow, but these little birdies are definitely at the top of my favorites list. there are 5 tags, each with a different bird on it. 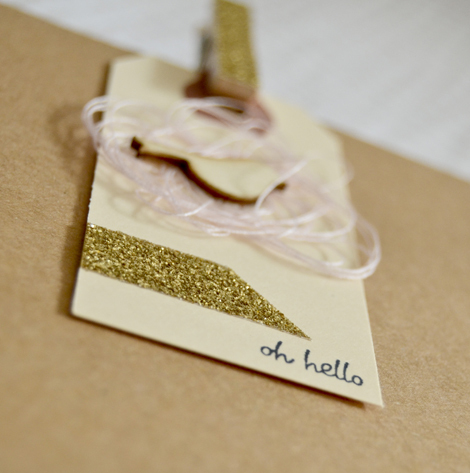 i covered a mini wood clothespin with gold glitter tape and added another piece of the tape over the adorable sentiment. 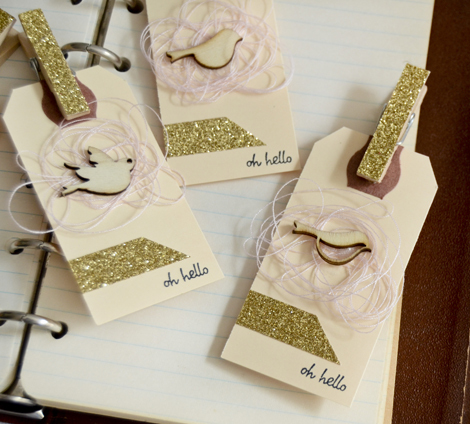 the "oh hello" stamp is by Amy Tangerine that i've had for awhile but didn't use until i made these tags. i'm totally smitten with it now; it's a roller stamp so it has something like 10 different tiny messages on it. it's incredibly cute and useful! 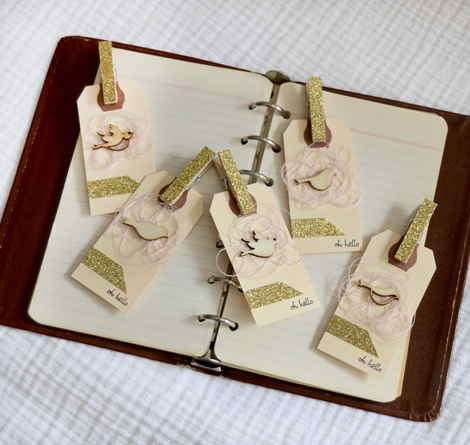 i'll be putting these up for sale in the Etsy shop a little later today and will also be offering a very similar set of tags in a special pink and gold embellishment kit. the kit will be available in late March--post baby! well, guys, that's it for me today. it's my hope to be back here for one more post before Monday but there's no guarantee. i'll definitely pop in after Little #2's arrival with some pictures of him/her. i can't wait to find out whether we're having a boy or a girl! i'm so glad we waited to be surprised--and it hasn't been easy through 6 ultrasounds. we have one more today so there's still an opportunity for someone to blow the surprise. everyone's got their opinions and it's been fun playing the guessing game. Hoss is convinced it's a girl based on the smaller size...we shall see! we've had a girl's name picked out since long before Mr. Bagubian, but are still unsettled on a boy's name...we'd better get going on that, don't you think?! oh, well, it'll be good to have something to think about during those wonderful contractions. take care and, as always, thank you so much for stopping by! Oh, now I am going to be thinking of you all weekend, and particularly Monday! How exciting! I can't wait to find out what you're having either - both of ours were a surprise, and we wouldn't have done it any other way. Congratulations (early), and I will be crossing my fingers for a smooth delivery and a healthy and happy little one! PS: Your tags are GORGEOUS... I am also in love with this colour scheme lately!! Thank you, Meredith! It's been so fun not knowing and I might be crazy, but I think the not knowing will help me get through the labor because when it's all over, the mystery will be solved!